Adams Introduces the all new AMPD30 Academy Series marimba designed to bring a new level of accessibility and quality to the playing experience of young percussionists. The Academy Series instruments feature a patent pending Integrated Resonator Rail System that provides not only a quality bar suspension and box resonator format, but also the rigid Aluminum Beam structure that makes these instruments the most durable on the market. 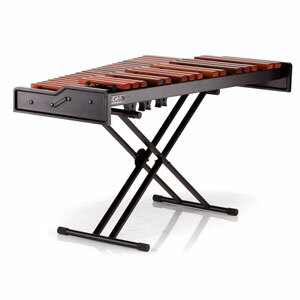 The AMPD30 marimba features the same Padouk bars as used on the Best –Selling Soloist Series instruments, giving the player a true graduated bar instrument to learn and grow with. Every tone bar of the Academy 3 octave marimba is hand-adjusted through the sixth overtone using the same bar tuning methods as the top of the line Adams Artist Series instruments. Only Adams is able to consistently produce in-tune instruments with a full and even tone for players at every level. Academy series keyboards can be used either on a table -top, or with the double leg X-style stand included with each instrument. The stand fits securely into one of three incremental slots to ensure stability while allowing the instrument to fit any size player. It’s simple yet ergonomic lightweight design lends itself for easy storage and set-up. A carry handle is provided to make transport easy, and a soft case will be available separately for those who need to protect their instruments from the elements. In addition, a drop cover and one pair of mallets are provided so students can begin playing as soon as the instrument is set-up. With the Adams Academy Series instruments, everyone can have a high quality wooden bar instrument at an affordable price, maximizing the learning experience at the earliest level.